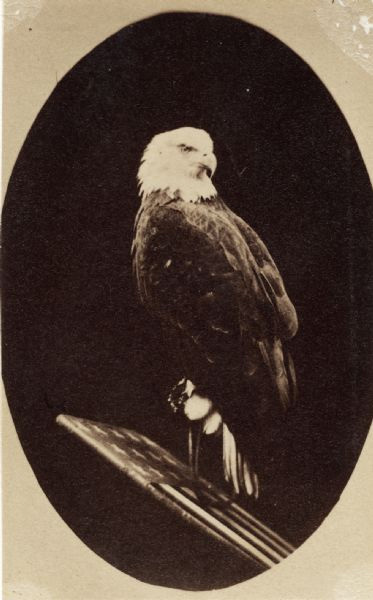 Old Abe the War Eagle was the mascot of the 8th Wisconsin Infantry. He was carried on a special perch throughout the entire war and became a symbol of Wisconsin's Civil War history in the decades that followed. The eaglet that would later be known as Old Abe was captured from his nest by Ahgamahwegezhig (Chief Big Sky) of the Flambeau Band of the Ojibwe Indians. Ahgamahwegezhig traded the bird to the McCann family of Chippewa County, Wisconsin, in the spring or summer of 1861. When President Lincoln called for troops to fight in the Civil War, the McCanns sold it to the Eau Claire militia for $2.50. The militia carried him to Madison where he became part of the 8th Wisconsin Infantry. Captain John E. Perkins named him Old Abe after President Lincoln. After training at Camp Randall in Madison, Abe accompanied the regiment as it headed south. Old Abe witnessed 37 battles and skirmishes, including some of the bloodiest fighting at Vicksburg and Corinth, Mississippi. He became an inspirational symbol to the troops rather like the ceremonial flag carried by each regiment. Col. Rufus Dawes of the Iron Brigade recalled, "Our eagle usually accompanied us on the bloody field, and I heard [Confederate] prisoners say they would have given more to capture the eagle of the Eighth Wisconsin, than to take a whole brigade of men." At the end of the war, Old Abe was presented to the State of Wisconsin. For 15 years he lived in the "Eagle Department" in the basement of the Capitol, attracting thousands of visitors. During this period Old Abe also served as the star attraction at many fundraising events, earning thousands of dollars for politicians and charities. Old Abe's long life ended March 26, 1881, when he died from smoke inhalation during a fire in the Capitol. His remains were stuffed and mounted, and for the next 20 years his body remained on display in the rotunda of the Capitol building. After construction of the new State Historical Society building in 1901, Old Abe was briefly housed at that facility before being moved back to the Capitol in 1903. His remains were destroyed a few months later when the Capitol building burned down on February 26, 1904.